The chart below illustrates our financial services. 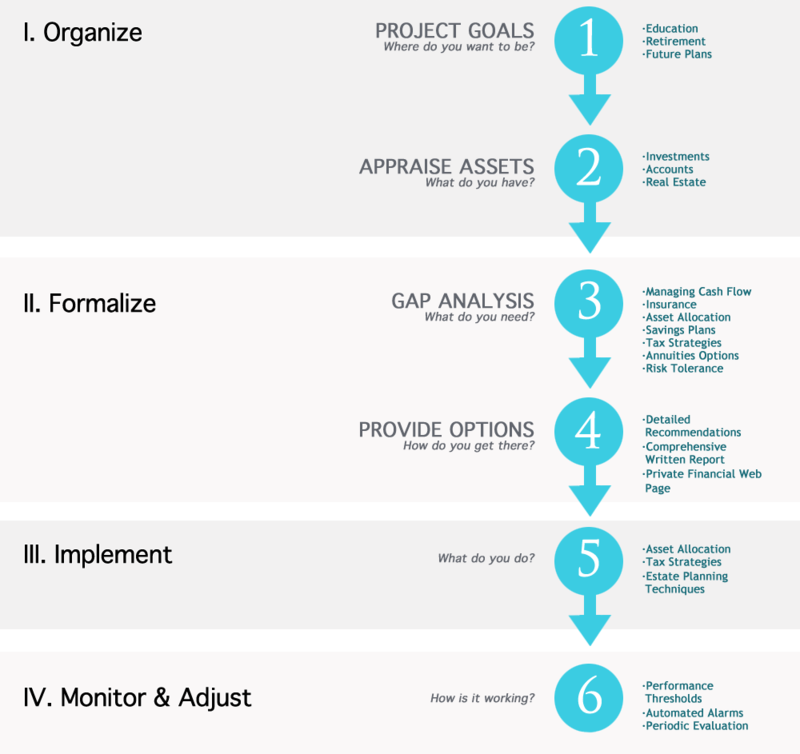 Our six step process is created with our clients in mind. This is where you meet one of our personal financial representatives to discuss your goals for the future. We get the chance to know you on a more personal level, listen to your concerns and needs, and begin to figure out an end goal for you and your personal finances. Whatever your needs are, this is where you tell us and we can begin to conceptualize your financial strategy. We only move to this step if you decide to work with us, and everything moving forward is kept confidential. Your comfort and trust is most important to us. In this phase, your personal financial advisor will analyze your current financial status and see how we can make your goals happen with your current assets. These assets include investments you’ve made, accounts you own, and your real estate. This gives us the big picture and allows for the development of a clearer end goal. A Gap Analysis is where we determine what it takes to get you from where you are to where you want to be. We make sure you have a sound strategy by preparing professional recommendations based on the analysis. Now that we have assessed how to get you “from here to there”, we formally convey to you the best possible options. We pledge to give you the best options available on the market, not just the ones that we offer. After finding out what you want, assessing what you have, developing solutions, and discussing all the potential options, it is time to make a choice. We stress that you, the client, is always in control and no decisions will be made without your consent. Your strategy is planned out and implemented, but the job is not done. We keep tabs on your investments and assets to make sure that everything is running smoothly. You will be continuously updated, but we encourage two-way communication. We are here for you, so feel free to contact us with any questions or concerns anytime.